Natures Aid Standardised Korean Ginseng is standardised to provide 16mg ginsenosides. For many centuries, the people of the Far East have considered Ginseng important for the maintenance of good health. Panax is derived from the Greek word panaces meaning `all healing`. Di-Calcium Phosphate, Microcrystalline Cellulose, Korean Ginseng Extract prep (Korean Ginseng Extract, Maltodextrin), Anticaking Agent (Vegetable Source Magnesium Stearate). Take 1 - 2 tablets per day. Below are reviews of Natures Aid Standardised Korean Ginseng - 90 Tablets by bodykind customers. If you have tried this product we'd love to hear what you think so please leave a review. 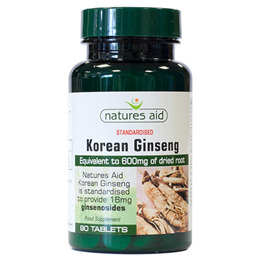 Natures Aid Standardised Korean Ginseng is standardised to provide 16mg ginsenosides. For many centuries, the people of the Far East have considered Ginseng important for the maintenance of good health.